Sleeveless gambeson is one of the most popular model of medieval padded underamor in XI-XII centuries. Warriors who did not take participation in close fights were preferably wearing such vest gambeson. It did not protect the whole body, but was good protection for archers and crossbowmen who were fighting on distance. Black leather straps for fastening. There are various materials are available for such padded vest. As fabric of gambeson was showing social status of owner, you may choose velvet, wool, leather or more simple linen or cotton. Bottom edge can be decorated with festoons. We offer different quantity of layers for your sleeveless gambeson. If you plan to wear quilted gambeson under the hauberk, so 5-6 layers will be required. If there will be full-plate armor or brigandine, so 2-3 layers of wadding is enough. Almost for every gambeson by Steel Mastery, we offer such options as “Laced sleeves”. 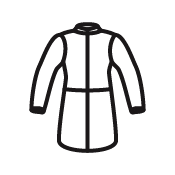 This option allow you transforming any gambeson jacket into sleeveless gambeson. Blue, red or green gambesons were the most widespread that time. If you choose half-coloured or quarter-coloured padded vest, please inform us at [email protected], what colours you prefer and its exact disposition. We recommend completing your padded protection with chausses and pelerine. Check out also other models of light gambesons: sleeveless gambeson with festoons of the XII-XIII centuries, sleeveless gambeson of XII-XIII centuries. If you are looking for a short-sleeved gambeson, these models might be interesting for you: gambeson of the VI-XIII centuries, aketon of the XIV century. In section “Gambeson” you can see all models that we offer for ordering. If you didn’t find any for your taste and wish, please send us photo and description of the required model and we will make it for you. Early medieval gambeson of the VI-XIII centuries is popular model of padded armor that can be seen in the Byzantine annals and church fresco. Short sleeved gambeson was peculiar to footmen, archers and crossbowmen. Taking into consideration the short sleeves, this medieval gambison had been worn by people who did not take participation in close fights, or did not have enough money for totally closed gambeson armor. Made-to-measure gambeson may be sewn by two ways: machine manufacturing. Tailors will make padded armor by your parameters, using sewing machine. hand sewing. Custom gambeson will be completely sewn by hands of our tailors. Such type of manufacture is historical one and is offered for additional costs. 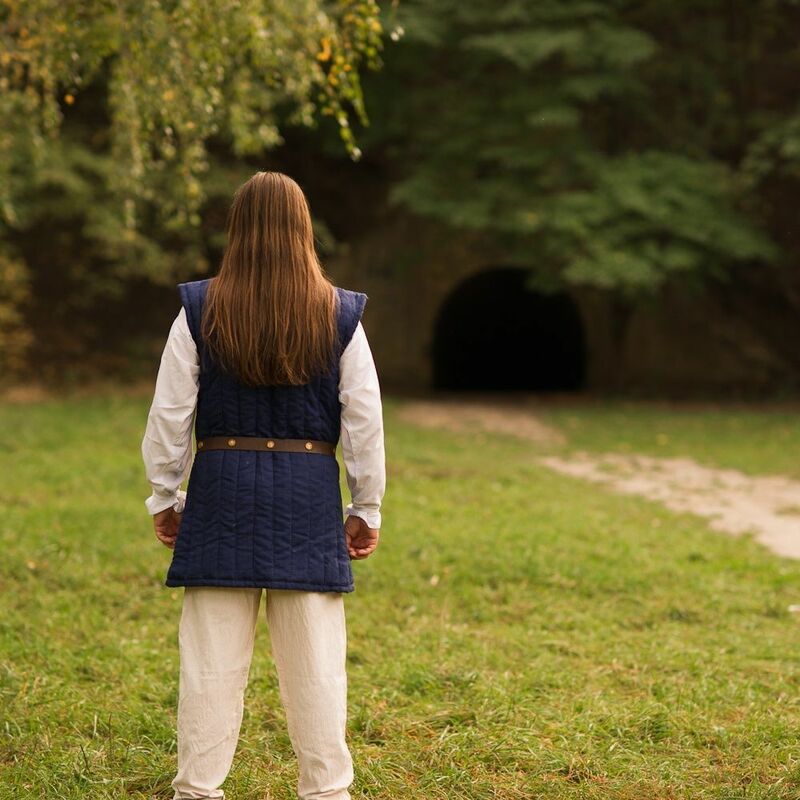 You can use this medieval gambeson for: SCA HEMA Larp Stage performances Medieval festivals Reenactment events Base price includes following options: 1-2 layers of padding (natural sheet wadding 50% cotton, 50% wool); Natural (uncoloured) cotton for outer and inner shell; S.. Arming doublet/aketon of the 1360 year is historically correct model and mostly known as pourpoint of Charles de Blois. The main peculiarity of this quilted body protection wass large amount of buttons on the sleeves and from the front of gambeson. It has tight fit in body part and sleeves. Pourpoint could be worn as arming clothing, so parade one. Made-to-measure gambeson armour may be sewn by two ways: Machine manufacturing. Tailors will make padded armor by your parameters, using sewing machine. Hand sewing. Custom gambeson coat will be completely sewn by hands of our tailors. Such type of manufacture is historical one and is offered for additional costs. You can use this gambeson armor for: SCA HEMA Larp Stage performances Medieval festivals Reenactment events Base price includes following options: 1-2 layers of padding (natural sheet wadding 50% cotton, 50% wool); Natural (uncoloured) cotton for outer and inner shell; Standard sleeves’ attaching (closed armpit); XS-size; 20..
Long gambeson of the XI-XV centuries was worn preferably by mounted knight. Though, infantrymen and foot soldiers were using such model as well. Completed with brigand or metal armor, such gambison provided with perfect protection even in close fight. Made-to-measure gambeson may be sewn by two ways: Machine manufacturing. Tailors will make padded armor by your parameters, using sewing machine. Hand sewing. Custom gambeson will be completely sewn by hands of our tailors. Such type of manufacture is historical one and is offered for additional costs. You can use this long gambeson armor for: SCA HEMA Larp Stage performances Medieval festivals Reenactment events Base price includes following options: 1-2 layers of padding (natural sheet wadding 50% cotton, 50% wool); Natural (uncoloured) cotton for outer and inner shell; XS-size; Straight bottom edge; Black leather straps for fastening. Outer material of gambeson armor always showed social status and financial health of own..